Embedded LED can be added to membrane switch as required to be identified by equipment working condition. And we can provide embossed or flat LED window with clear or colored printing on the overlay ,also LED can be used as backlight effect for the key. 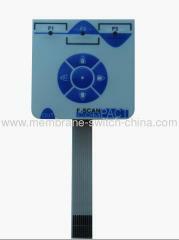 Membrane switches can be supplied with single or bi-color LED's. Standard single color LED's are red, yellow,blue, orange and green.Bi color LED's are readily available as red/green, yellow/green, and red/yellow. Other single or multi color led's are available by special order.